The promise of a B-movie thriller, littered with talent across the board and an interesting setting is immense. Bad Times at the El Royale is all those things, with heaps of homages and tributes to films in a similar vein that have come before. This colorful affair has all the workings of a truly special film, if they actually come together in an effective manner. The El Royale is run-down hotel that sits on the border between California and Nevada. 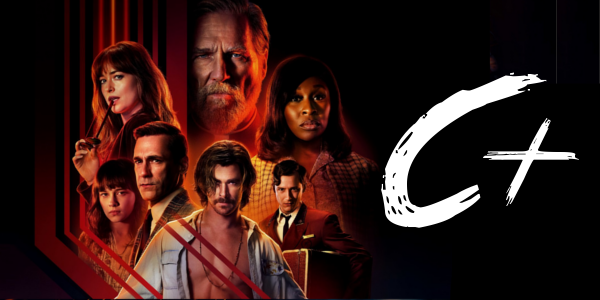 It soon becomes a seedy battleground when seven strangers — a cleric (Jeff Bridges), a soul singer (Cynthia Erivo), a traveling salesman (Jon Hamm), two sisters (Dakota Johnson & Cailee Spaeny), the manager (Lewis Pullman) and the mysterious Billy Lee (Chris Hemsworth) — converge on a fateful night for one last shot at redemption before everything goes wrong. A star-studded ensemble cast is easily amongst the most enticing elements of Bad Times at the El Royale, and rightfully so. Everyone delivers a good performance, with some standing out above the rest of course, and instantly become the highlight amidst the more disappointing portions of this thriller. Performances from Erivo and Bridges bring the most depth to the table, in part due to the slightly more detailed characters each receives. However, Hemsworth emerges as the biggest winner here. His role as the dastardly Billy Lee is both charming and somehow haunting at the same time, embodying the cult leader status perfectly. Hemsworth is clearly enjoying the smarmy nature of the character, and it shows in the performance. Unfortunately, due to the sheer size of the cast, none of the characters really get to shine in the end. The film is almost lost on who should be the central character within the group, and thus it devolves into a cluttered narrative, full of flashbacks and parallel storytelling that sets up more questions than it’s willing to answer. And in this jumbled structure, the film fails to really nail down the direction it wants to go with the tone. The film is not lacking in creativity nor ideas, and the craft behind it is still pretty great, but the script feels as though writer and director Drew Goddard could’ve spent more time on nailing the themes down. The first two acts operate in this fun genre thriller that is suitable for the premise even if flawed, but by the third act is dips into a few emotional moments that feel completely unearned. Bad Times at the El Royale is far from a bad film, just disappointing. With nothing but quality on his resume, the name Drew Goddard is beginning to carry some weight and some anticipation, and this film doesn’t quite meet them. Hemsworth gets the biggest praise for the utter commitment to his role, but the cast delivers across the board. It’s a fun, albeit silly at times and way too long, thriller that seems to bite off just a bit more than it can chew and suffers for it.